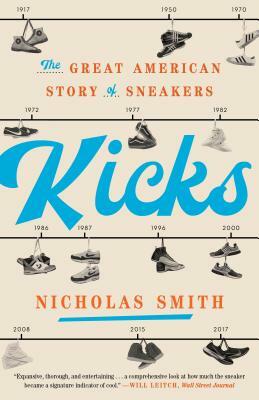 Join us at Book Culture on Columbus as Nicholas K. Smith discusses his newest book, Kicks: The Great American Story of Sneakers, on Monday, April 29th at 7pm. Professor Samuel G. Freedman will be joining Nicholas in the discussion. Nicholas K. Smith is a journalist and author. He was a staff reporter and web editor for Arizona-based publications the Tucson Weekly, Inside Tucson Business, and the Explorer Newspaper. He was also a research assistant at the Earth Institute at Columbia University where he was the managing editor of GlacierHub.org, a science news website that seeks to deepen the understanding of glaciers. Smith has contributed to numerous other publications and websites including Time.com, espnW.com, Esquire.com, GlobalPost, Like the Wind magazine, and Fodor’s Vienna and the Best of Austria travel guide. He is a recipient of the 2014 Lynton Fellowship in Book Writing and has received awards from the Arizona Press Club for community reporting, sports reporting, and web editing. Smith received a master’s degree from the Columbia University Graduate School of Journalism in 2014 as well as bachelor’s degrees in journalism and business administration from the University of Arizona in 2006. A native of Arizona, Smith now lives in Vienna, Austria with his wife and two children. Samuel G. Freedman is an award-winning author, columnist, and professor. A former columnist for The New York Times and a professor at Columbia University, he is the author of the eight acclaimed books, and is currently at work on his ninth, which will be about Hubert Humphrey, Civil Rights, and the 1948 Democratic convention. Freedman holds a bachelor’s degree in journalism and history from the University of Wisconsin-Madison, which he received in May 1977. He lives in New York with his wife, Christia Chana Blomquist.